The economical choice in small-volume nebulizers. Anti-spill T-piece design. Very low dead volume. 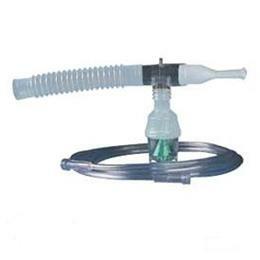 Nebulizes at angles up to 45 degrees. Graduated volume marking on medication chamber. Disposable, latex-free. Kit configurations include a standard mouthpiece kit, an adult mask kit and a pediatric mask kit.Capacity 5ml T-piece, mouthpiece 7' tubing, 6 in. flextube.